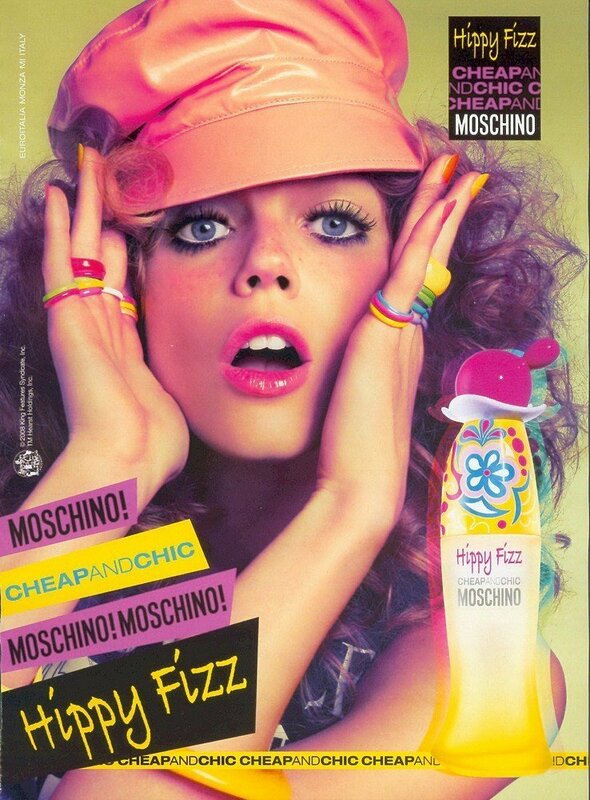 Cheap and Chic - Hippy Fizz is a perfume by Moschino for women and was released in 2008. The scent is fruity-citrusy. It was last marketed by EuroItalia. Bright and Cheery, Shiny and Abstract: another SSRI! Moschino CHEAP AND CHIC HIPPY FIZZ reminds me immediately of Salvatore Ferragamo INCANTO BLISS upon application. There is a kind of citrusy quality, something of a fruity-floral demeanor, and a bright and shiny sheen to this creation which places it directly into the twenty-first-century category of SSRI fragrances. Both of these fragrances list lotus as a note, so that probably accounts for part of the similarity as well. I think that the quality of HIPPY FIZZ is just a notch above that of the Salvatore Ferragamo INCANTO flanker series, which work for me much of the time when I'm dashing out the door and want a quick spritz of something inoffensive and kind of nice and good for public places. Every once in a while the synthetics clash with something going on. Is it the weather--the temperature or humidity--or is it the wearer? Not sure, but the point is that sometimes they work; sometimes they do not. In the case of HIPPY FIZZ, I have not yet had a "bad trip", though it may simply be waiting to happen, as this, too, is obviously a synthetic composition which is bound to clash with something sometime somewhere. Today, however, it smells quite nice: bright and cheery and light and citrusy with an inviting woody drydown, which I--perhaps through the power of suggestion--thought might even involve a bit of patchouli. Anyway, it smells good: the moss and the cedar are producing a sort of pseudo light-patchouli effect. I like this perfume, for what it is. Nothing profound, but a good choice when only an SSRI frag will do! The bottle is oddly adorable, too. I don't understand the hippy reference here. I usually connect patchouli and incense to the scent of a hippy. However, this sparkling citrus fragrance is certainly fizzy. Hippy Fizz is very similar to Funny! by Moschino. Although lemon and bitter orange is not listed in the notes, they are certainly present, especially in the top notes. The scent itself is very crisp and Summery. Refreshing in fact. I don't sense much in the way of rose or violets, however the lotus and magnolia blend in well with the citruses. I was a little disappointed by the lasting strength which was extremely poor. So all in all, I'd suggest Funny! as a better alternative as something that is very similar and longer lasting. Write the first Review for Cheap and Chic - Hippy Fizz!